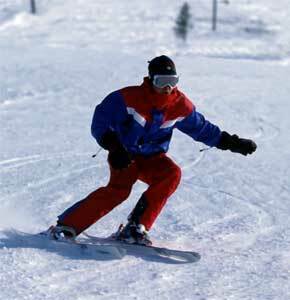 Ski on the best slopes Northwest Russia offers and be surrounded by the magnificent Khibiny Mountains. We invite you for a ski holiday in our cosy Lumberjack guesthouse "Yolki-Palki". where you can enjoy the quietness of the northern nature, tasty meals cooked according traditional Russian receipts, the hot sauna in the garden and watch the Northern Lights dancing above you. 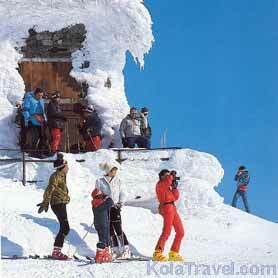 "Yolki-Palki" is situated 35 km east from Kirovsk city; the major downhill skiing centre in the Northwest of Russia. It has tracks of various degree of complexity and with a total length of about 30 km. Six ski-tracks (slalom, giant-slalom, super giant and downhill) have certificates of FIS. The tracks for freestyle correspond to the international standards. Eight rope tows and a chair lift are waiting for you on the downhill skiing slopes of Ajkuajvechorr and Kukisvumchorr Mountain in Khibiny Mountains. In Kirovsk city you can find nice après-ski possibilities like bar, bowling centre, discotheque and nightclub. The best season for alpine skiing is March and April, and sometimes even May. We have a lot of snow and a lot of sunshine because the polar night is over. Rich snow-falls give blanket of snow up to 5 meters. Of course, weak-snow winter can happen, too. If you want to meet polar night and Aurora Borealis you can come to ski in December or January. It can be very frosty or sometimes windy. You can come to us by own car and cross Russian border in Salla, Ivalo (Finland) or Kirkenes (Norway). Or you can fly by aeroplane to Murmansk or Kirovsk airport. We will help you to choose the route and flight if you send us a request. We offer transfers from and to Murmansk airport to "Yolki-Palki" and twice per day transfers to and from the skiing-slopes. From the slopes busses or shuttle taxies aregoing to Kirovsk city. Lumberjack guesthouse "Yolki-Palki" In Double or triple rooms. Read more >>. •Prijs für 2 persoonskamer: EUR 36,-- per nacht. √ Kinderen tot 7 jaar kunnen gratis bij ouders auf kamer. √ In a minibus (up to 8 persons): 330 EUR per bus.